NUSAJAYA Lifestyle Sdn Bhd, a joint-venture company between UEM Land Holdings Bhd and Iskandar Harta Holdings Sdn Bhd (IHHSB), a wholly-owned subsidiary of Iskandar Investment Bhd held the soft opening of Phase 1 of Mall of Medini to the general public early last month. Drawing inspiration from globally-successful theme park and lifestyle retail centres in the United States such as Americana, The Grove and Universal Citywalk, Mall of Medini is envisioned to become the lifestyle, entertainment and recreational epicentre of Nusajaya, one of the five key nodes of Iskandar Malaysia, Johor. Its symbiotic relationship with the adjacent Legoland Malaysia positions Mall of Medini as the new standard in theme park-linked mixed-use development, offering food, shopping, entertainment and lifestyle experiences. Dedicated to the needs of local and international visitors as the gateway to Legoland Malaysia, Phase 1 of Mall of Medini offers an intimate high-street, colonnade-style retail setting in a elegant yet lively and festive environment, which encourages interaction between the internal and external, as a departure from conventional “box” shopping malls. The cool, naturally-ventilated shopping environment celebrates Malaysia’s tropical climate and complements the theme park setting of Legoland Malaysia. 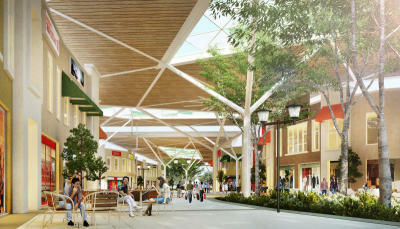 Retail therapy: An artist’s impression of the recently opened first phase of the Mall of Medini. Visitors will find a retail mix ranging from F&B, fashion, and gifts and souvenir shops, complimented by a mix of big band/swing and jazz music flowing throughout the thoroughfare. Presently, 90% of the retail space have been taken up by names such as KFC, Manhattan Fish Market, Royal Selangor, Penang Village, Kaki-Kaki Reflexology, Polo Haus, Al-Ikhsan, Tutti Frutti, 1901, myNews.com, Blackball and more. A key ingredient of Mall of Medini’s recipe for success is its strategic location, virtually in the heart of Nusajaya. Its connectivity to nearby signature developments such as Kota Iskandar, Puteri Harbour, Horizon Hills, Educity, as well as residences in Nusajaya and the rest of Medini Iskandar Malaysia provide an ample population catchment. This, coupled with road and highway networks to other population hubs such as Johor Baru City Centre, Bukit Indah and Singapore, provide easy accessibility to Mall of Medini. Future phases of the project will introduce an exciting new addition to the whole development. Phase 2 will be designed to cater to the sports-centric, teenagers, and the young at heart, focusing on recreational and activity-inspired spaces such as an ice skating rink, laser tag arena, rock climbing walls, indoor karting track, and more. Phase 3 will provide art and cultural spaces dedicated dance studios, fitness centres, art school, boutique galleries, experimental theatre and so on. Phase 4 will complete the big picture with the entertainment based big box retail, with bowling alleys, multiple cineplexes, and experiential dining. An Architectural Design Competition for the design of the subsequent phases, featuring Malaysia’s most renowned architects is currently in its final stages, and the design will be unveiled in the near future. Mall of Medini opens daily from 9am to 9pm and is located at No 4, Lebuh Medini Utara, Medini Iskandar Malaysia, 79200 Nusajaya, Johor. Alternatively, visitors may use GPS coordinates 1.428868, 103.633218 to locate it. For further information and inquiries email mallofmedini@uemland.uemnet.com, or visit Mall of Medini’s Facebook page.